We invite submissions to IMVIP 2019 of papers presenting novel research contributions or applications related to any aspect of computer vision or image processing. IMVIP is the annual conference of the Irish Pattern Recognition and Classification Society, a member body of the International Association for Pattern Recognition (IAPR). Papers must be a maximum of 8 pages including references and appendices. Papers can be presented orally or by poster. A Poster Template will be available in July. We are delighted to have two exceptional plenary speakers at this year's conference: Prof Paul F Whelan of Dublin City University and David Moloney of Intel Movidius. The full programme is to be finalised closer to the conference date. There will be poster and oral presentations in addition to our invited speakers. IMVIP 2019 will be held in St. Laurence's Church, pictured above on the left, on the Grangegorman Campus. The campus is just a 1 km walk from Dublin City Center and is also easily accessed using the Luas tram. Maps and transport information are available here. 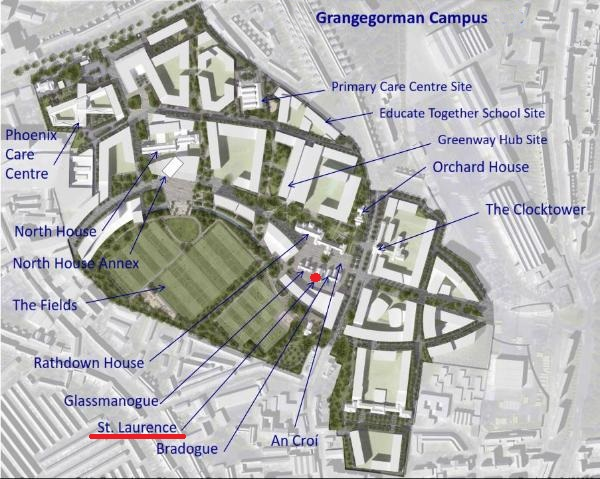 The red dot on this map image indicates where St. Laurence's is located on the campus. Recommended accomodation and Banquet location will be provided closer to the conference date.